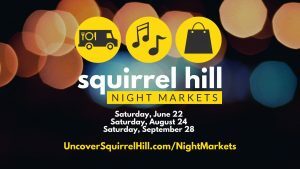 Inspired by pop-up night markets in Asia and around the world, the Squirrel Hill Night Market is a free, outdoor street festival that’s fun for adults and kids of all ages! Offerings from your favorite Squirrel Hill restaurants. An event by Uncover Squirrel Hill and I Made It! Market.